I’m on vacation this week so I’ve invited some of my blogging favorites to share their beauty favorites. Today’s post is by Anna from Designed By Ann. She’s Greek so she knows what’s she talking about. In Greece, yoghurt is perceived to be a good way to heal sunburn. Korres, a Greek natural cosmetics brand, used yoghurt (and it’s healing properties) to create an after sun cooling gel that both hydrates the body and heals sunburn. First time I used the product was when it was given away as a sample with a magazine. I liked the way my skin felt after applying the cooling gel so I went on to buy it myself and use it as body lotion all summer long! Korres After Sun Yoghurt Cooling Gel is more dense than a typical after sun body lotion and isn’t absorbed on the spot, but in this way it makes your skin cool off after spending hours in the sun! It can be used both on face and body. Lately it also came to my attention that specifically for the face there is Yoghurt Instant Soothing Gel (which I haven’t tried because it is a Korres USA only product :( but I bet it’s good as well). 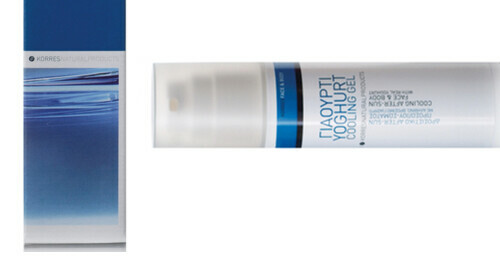 So, enjoy the sun and cool off with Korres Yoghurt After Sun Cooling Gel afterwards! Does this: Cools off and hydrates skin after sun bathing; helps heals (moderate) sunburn.